Peppa Pig has been around for 14 years as a character on television and in picture books, but she’s retained her youth: she looks to be barely four. Yet at this tender age, she’s already thinking about where she will fit in; what career will suit her? Childhood is evidently being truncated in the modern world; one minute you’re a toddler, delighting everyone with your charming antics and the next minute you’re trying to figure out where your talents will intersect into the wide world of commerce. It doesn’t seem quite fair! But another recent picture book, Who Will I Be? by Abby Huntsman, illustrated by Joanne Lew-Vriethoff, is also concerned with the subject of jobs. So this issue must be trending. But Peppa is into the idea of a career. The various animals who visit Peppa’s class explain what they do. There is a great variety which is refreshing: they meet lighthouse keeper, a helicopter pilot, a vet, a sea captain, an artist. These choices are a nice departure from the ubiquitous movie star, police officer, space explorer, or pitcher we’re so used to. For a corporately produced book, this is not without its charms. The illustrations are child-friendly and amusing, the graphics and typeface invite involvement. The text is without frills, that is to say it’s exuberant but basic. 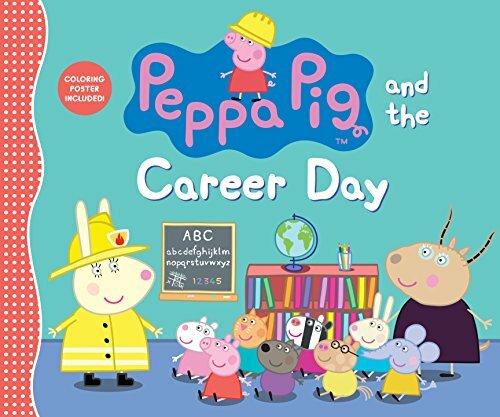 As far as being a useful product, reading Peppa Pig and the Career Day is a good way to communicate with children who are wondering what their far distant future might be.